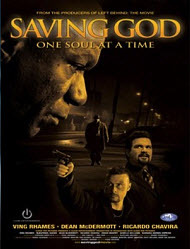 “Saving God” is about a convicted felon Rev. Armstrong (played by Ving Rhames) who returns back to his neighborhood a changed man looking to take over his father’s old church. The neighborhood is tough and full of drugs and gangs. Through Armstrong’s tough demeanor and strong faith he tries to make a difference with Norris—a youth on the edge of falling into a lifetime of drugs and gangs. Also, Armstrong must deal with his past history of violence and make sure he doesn’t fall again. Star Ving Rames is well known for his appearances in the “Mission Impossible” films (1-3). Director Duane Crichton (left) prepares to shoot a scene from “Saving God.” Crichton is a celebrated music video and commercial director. This is his feature directorial debut. The film is produced by Clear Entertainment’s Domenic Serafino, Wayne Thompson, Philip Mellows and Cloud Ten Pictures’ André van Heerden. Ving Rhames serves as executive producer. Cloud Ten Pictures is the North American distributor for both their national “Church Cinema” release October 10, 2008 and for home entertainment DVDs on October 14. Earlier this year, Cloud Ten signed a distribution deal with Koch Entertainment, the independent music and DVD distributor that also has become more involved in faith-based music and DVDs. Koch will distribute all new Cloud Ten films to the retail market and will replace Sony Pictures Home Entertainment for North American distribution of existing Cloud Ten films in North America. For distribution to churches and specialty markets, Cloud Ten has signed an agreement with Nashville-based CNI Distribution, a division of Christian Network International. The Cloud Ten “Church Cinemas” arm will release all of the company’s upcoming films to churches before they go to other distribution channels. Cloud Ten used the church-premiere strategy for its recent installment in the “Left Behind” franchise, “World at War.” The film was released in more than 3,200 churches in North America during its first weekend, representing a larger opening than any other film that opened in theaters the same weekend, according to Cloud Ten. Based on that success, Cloud Ten plans to premiere one new film in churches every three to four months.